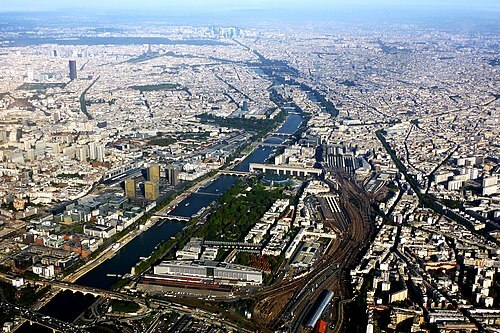 The Seine ( SAYN,  SEN, French: [sɛn] (listen)) is a 777-kilometre-long (483 mi) river and an important commercial waterway within the Paris Basin in the north of France. It rises at Source-Seine, 30 kilometres (19 mi) northwest of Dijon in northeastern France in the Langres plateau, flowing through Paris and into the English Channel at Le Havre (and Honfleur on the left bank). It is navigable by ocean-going vessels as far as Rouen, 120 kilometres (75 mi) from the sea. Over 60 percent of its length, as far as Burgundy, is negotiable by commercial riverboats, and nearly its whole length is available for recreational boating; excursion boats offer sightseeing tours of the river banks in Paris, lined with top monuments including Notre-Dame, the Eiffel Tower, the Louvre Museum and Musée d'Orsay.There are 37 bridges within Paris and dozens more spanning the river outside the city. Examples in Paris include the Pont Alexandre III and Pont Neuf, the latter of which dates back to 1607. Outside the city, examples include the Pont de Normandie, one of the longest cable-stayed bridges in the world, which links Le Havre to Honfleur.